The concept is simple. Each week you must pick 1 team to either win or lose depending on the type of pool you create. The kicker is that you cannot pick the same team more than one time per specificed date range of your Survivor/Loser Pool. For example, if you are running an NFL Survivor Pool and have it set to run from Week 1 to Week 17 then you are only allowed to pick each NFL team once throughout the season. However, if you set your Pool to run from Week 1 to Week 8 then you are running a shortened pool and after Week 8 you can setup another Survivor pool and pick again from the entire list of NFL teams. The participant that picks correctly the longest wins. As with our other office pools you have the option to pick a straight up winner/loser or pick against the point spread, it is entirely up to you. What does a NFL Knockout or Football Survivor/Loser Pool cost? Regular Season Football Survivor/Loser Pools cost $9.99 per pool and includes up to 10 users, each user beyond 10 costs $1. 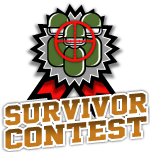 However, you can create your own Survivor or Loser Pool today for FREE at no risk of being charged. If you find it to meet your expectations and needs you will be required to pay your invoice within 7 days after the pool starts by simply using one of our easy payment methods including Visa, Mastercard, Paypal or Paper Check. Does Contest General offer White Label Skins for NFL Survivor/Loser Pools?